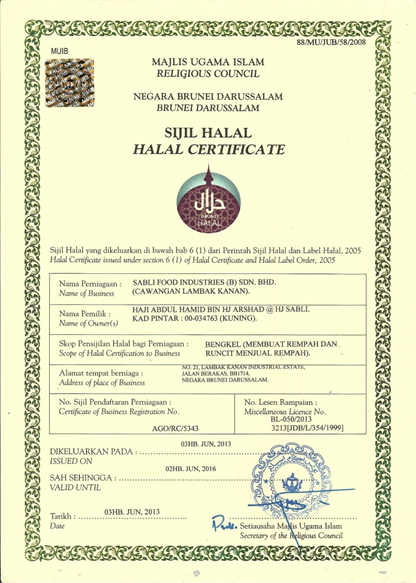 Sabli Food Industries (B) Sdn Bhd was founded in 1985 and a member of Sabli Group of Companies. Before incorporated into a private limited company in January 2002, the company started its business utilizing Sabli Development & Engineering Co for spices packaging under a brand known as "CAP LAMPU", operated in a rented shop house in Bangunan Menglait Dua, Gadong. Later in the business in 1987, Sabli Food industries Co was established. Upon established the company began its production of spices and flour based food products. Initiating from a 'cottage industry' Sabli Food had transformed itself into the main producer of spices in Brunei Darussalam. It was then the company introduced its new brand known as "SABLI'S". The new generation of Sabli Food products will also aims to serve consumers with health concern and developed for both domestic and international markets. "A Respected Leader In Halal Food Producer"